The story of wildlife conservation along the upper stretches of the Mississippi River in the mid-20th Century is very much a tale of environmental change, economic growth, and power politics. 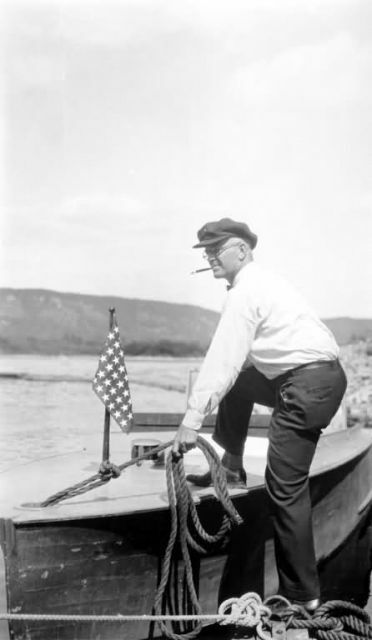 Created in 1924 as one of AmericaÃ¢â¬â¢s most unique national wildlife refuges, Upper Mississippi River National Wildlife and Fish Refuge was the product of intense lobbying by the fledgling Izaak Walton League of America. Sportswriter and avid bass fisherman Will Dilg enlisted the help of the Ã¢â¬ÅIkesÃ¢â¬Â after he discovered plans to dike and drain 15,000 acres of Mississippi River backwater and pristine bottomland known as Winneshiek Bottoms on the Wisconsin side of the river. Eventually, stories said, the entire reach between Wabasha, Minnesota, and Rock Island, Illinois, would be reclaimed. A national campaign by the Ã¢â¬ÅIkesÃ¢â¬Â lead to creation of the Federal refuge Ã¢â¬â but its authorizing legislation made it clear that fish and wildlife conservation was subordinate to river navigation, leading to decades worth of debate over the effects of lock and dam construction on the formerly free-flowing river system. Ã¢â¬ÅThe Upper Mississippi River National Wildlife and Fish Refuge had no choice but to adapt to the navigation project,Ã¢â¬Â an Izaak Walton League report later concluded. Ã¢â¬ÅWhether lock-and-dam construction would be good or bad for the refuge mattered little. Between 1933 and 1940, 26 lock-and-dam complexes were built on the Upper Mississippi and Illinois rivers. Eleven lie within the boundaries of the refuge.Ã¢â¬Â In the early days, there was much debate on this point; in 1930, refuge manager Ray Steele concluded, somewhat surprisingly, Ã¢â¬ÅIt is the opinion of this office that anything serving to increase the extent and depth and to stabilize water levels will be beneficial to the refuge.Ã¢â¬Â Here, manager Steele surveys the river in 1937 from one of the first two patrol boats built at the refuge.